Located in the Andes near the Chilean border, Aconcagua is the highest mountain in the world outside of the Asian continent. Team members fly over the Andes mountains into the city of Mendoza, Argentina, our staging area for our Aconcagua climbs and home of the famed Malbec grape. We’ll spend a day in Mendoza gathering climbing permits and preparing gear before traveling to the trailhead at 2400m/7874′. Over two nights and three days, we trek along the scenic and remote Vacas Valley, gradually introducing elevation as we close in on Base Camp at 4200m/13,747′, our staging area for further acclimatization. The next week, in between carrying loads we rest and establish camps at 5090m/16,700′, 5480m/17,979′, and 5970m/19,586, offering time to acclimate and prepare for our summit bid. Our route circles under the Polish Glacier en route to high camp and on summit day intersects the Normal Route a short distance below the Independencia Hut at 6400m/21,000′. The last 562m/1843′ of the climb ascends the Canaleta chute, which on a clear day offers views of the famed South Face. Our descent retraces our steps back to High Camp. The following day we descend down the north side of the mountain to the Plaza de Mulas Base Camp at 4300m/14,107′. From here it is a one day walk out the beautiful Horcones Valley. Aconcagua requires participants to have previous experience with ice axe and cramponing skills and be in excellent physical shape. We highly recommended climbers to have completed our Snow Travel Course and Mountaineering Skills Seminar or equivalent before attempting this climb. An SMI team loaded up at Base Camp for the optional flight to the trailhead. 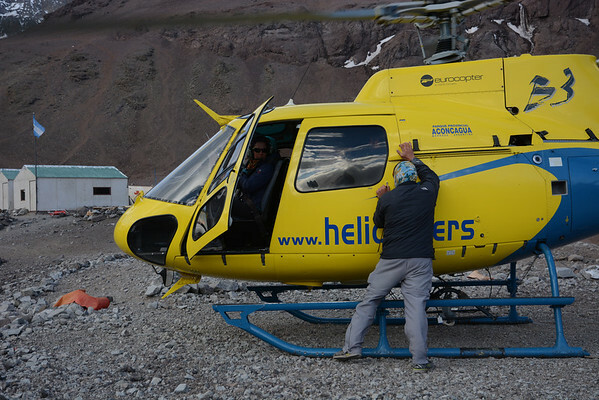 **Helicopter option for return from Base Camp: $1800 plus $300 Mendoza luggage delivery. Professional guides, hotels, breakfasts and dinners while on the mountains, all group equipment including tents, stoves, and other camping gear, and private transportation to and from Mendoza, mule drivers and mule support. Airline tickets, climbing permit fees, meals in restaurants, lunch food, personal equipment and clothing, climbing permit, airport taxes, tips, and luggage fees. Aconcagua’s Polish Glacier is approached via the Vacas and Relinchos Valley’s just like we do on our Polish Variation climbs.We then veer off left at the Amaghino Col and set in our high camp at 5830m/19,127′ at the base of the glacier. The glacier is over 55 degrees steep and can range from soft snow to hard ice. It requires climbers to be experienced in two tool ice climbing skills as well as advanced snow, ice, and glacier travel techniques. The Polish Glacier Direct is much more physically demanding than the Normal Route. We offer this climb to mountaineers with previous experience climbing above 20,000 feet. See our Ice Climbing courses and Mountaineering Skills Seminar for more information about reviewing these skills. Professional guides, hotels, breakfasts and dinners while on the mountains, all group equipment including tents, stoves, ropes, hardware, and other camping gear, and private transportation to and from Mendoza, mule drivers and mule support. The exit day from Base Camp is approximately 25km/16 miles and takes 7-9 hours through the Horcones Valley. For those wishing to avoid this walk we offer helicopter service. The helicopter ride is about 15 minutes and full of breathtaking scenery viewed from a unique vantage point. You are dropped off at the trailhead and transportation takes us to our hotel in Los Penitentes at the base of Aconcagua. The load limit is 300kg which is normally three people plus a handbag or two people and all their equipment. Equipment not brought on the helicopter is carried out with our mules on the following day.